In a set of two updates, the first coming Feb. 11, Microsoft will fine-tune Kinect voice controls and improve storage space management. Microsoft will implement its first system update for the Xbox One on Feb. 11, chief product officer Marc Whitten announced today. The update will provide several improvements to the dashboard, Kinect voice commands, and stability. A second update scheduled for Mar. 4 will prepare the console for Titanfall. Whitten said the company will not be going into the details of the product updates today as he laid out what people should expect to see starting Feb. 11. 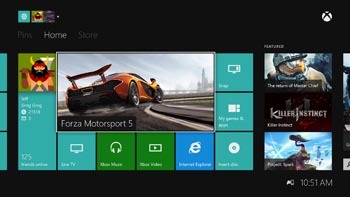 The update will allow Xbox One users to better view and manage content and storage. Users will be able to control the install lineup and better manage the download queue, including separate queues for games and apps as the two will be separated in the future. Kinect will be able to recognize voice commands better, making the system more responsive and fluid. Furthermore, the update will add a boot progress indicator for users to track updates as they load. Plenty more updates will be available behind the scenes for developers who build apps and games for Xbox One, but Whitten did not describe what the updates would entail. The dashboard will also have a battery power indicator on the home screen for convenience in tracking the remaining battery life of controllers. Whitten added that people will be able to use a USB keyboard with the Xbox One starting on Feb. 11. These are apparently "just a few of the many updates" and "surprises" to come next week. The Mar. 4 update will arrive in time for Titanfall's Mar. 11 launch. The update will "contain many new features and improvements, most significantly to our party and multiplayer systems," Whitten said. Titanfall is a Microsoft exclusive, multiplayer shooter in which players can fight on foot or inside mechs called Titans.